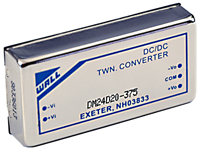 The DM series of DC/DC converters features units of 15 watts in a 1.0″ x 2.0″ x 0.40″ typical package. 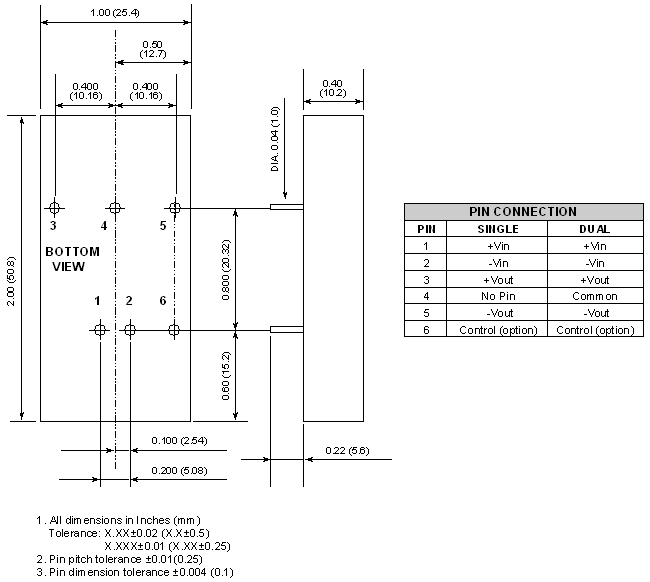 These units are PCB mountable and include an input filter for low reflected ripple, power foldback short-circuit protection, up to 1600VDC input/output isolation, and typical efficiencies of 80%. The DM series also offers options for overvoltage protection and remote on/off via TTL logic. Dimensions: 1in. × 2in. × 0.4in. Notes: 1. Input reflected ripple measured with simulated source impedance of 12 uH. 2. 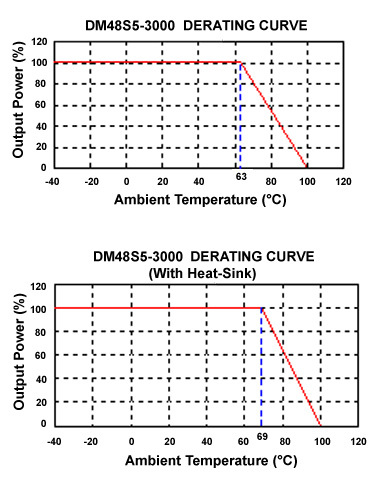 The DM series requires a minimum 10% load on the output to maintain specified regulation. Operation under no-load condition will not damage these devices, however they may not meet all listed specifications. 3. Efficiency is typical values at nominal input voltage and full load. 4. BELLCORE TR-NWT-000332. Case I: 50% stress, temperature at 40°C. (Ground fixed and controlled environment). 5. Heat sink is optional, consult factory. 6. Pin 4 absent on single output models. 7. Remote On/Off control is optional. For positive logic add suffix (P), for negative logic add suffix (R). 8. All case and pin to case dimensions are for reference only unless otherwise noted. 9. PC pins - 0.04" dia. X 0.20" long (minimum) typical five places. 10. Pin to pin tolerance: ±0.01", pin diameter tolerance: ±0.005". 11. Significant capcitive load on output may inhibit start-up and operation, consult factory. 12. All DC/DC converters should be externally fused on the front end for protection.